Here is a new video tutorial that shows you how I make a miniature slice of pie. This is just the basics and of course you can adapt it to make other pie varieties and flavours. If you want to do a lattice pie slice, you will need to weave some strips and cut out a circle. Then cut out a sector (same size as the base) to use. A new video next week will teach you how to make the pastry lattice from clay. Gloss the filling (cherry) after baking with a polymer clay gloss. I personally like using Fimo's gloss varnish which is thin (which is good when you are making items in a small scale) and gives a great shine. 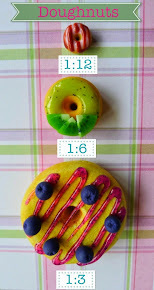 You should use polymer clay in this project as you will need to bake the Fimo liquid. Colour the surface with alcohol inks (like in the Mont Blanc recipe) for a richer colour and more realistic effect. It also adds a semi-gloss to the surface as well. Texture all edges by stabbing it using a needle (the part where the knife has cut through the 'pie pastry'). This is vital for realism. I am much faster in editing videos since the first time so I will queue up videos to publish when I am away in Japan for the whole month of June. Make sure to subsribe to the channel for more video updates.